A leading Spanish hotel operator is considering pulling out of Tunisia after extremist attacks that killed 59 tourists and devastated the country's tourism industry. RIU said in a statement on Monday that it is in talks with owners of the nine properties it currently operates in Tunisia about their future. 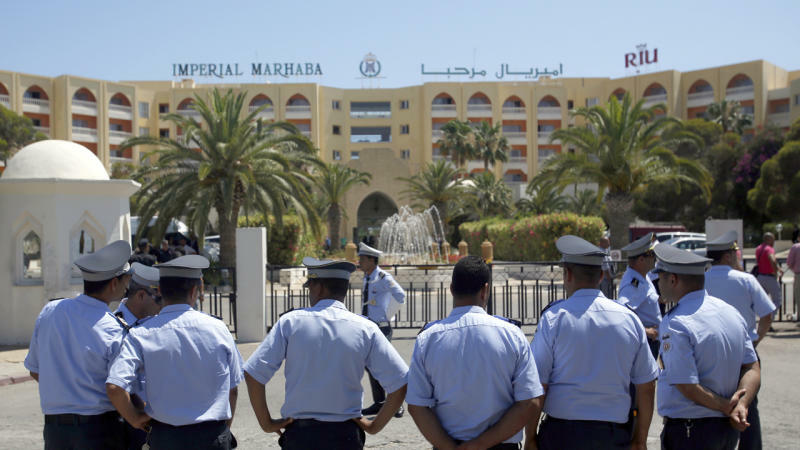 RIU operated the Imperial Marhaba Hotel targeted in a deadly attack on the Mediterranean resort town of Sousse in June. Tunisian Hotel Federation chief Radhouane Ben Salah told The Associated Press that RIU's decision was prompted by difficulty in marketing Tunisia to tourists after the attacks. He said the company will start pulling out of Tunisia on September 30, and may sell its operations to the hotel owners or other investors. He said about 50 of the country's 600 hotels have already closed since the attacks. Tunisia's tourism minister said on Sunday that the number of visitors has dropped 20 per cent so far this year to four million. The number of European tourists has dropped 50 per cent, the state news agency TAP reported, though Algerian and Tunisian tourists have made up a portion of the difference. A Tourism Ministry official said 50,000 jobs are expected to be lost out of about 400,000 total linked to the industry. The Tunisian central bank says tourism revenue this year is down 76 per cent since 2010, before a popular revolt overthrew a dictator and sparked uprisings around the Arab world.